By creating lenses and mirrors in a range of shapes—not just spheres or rotationally symmetric aspheres—freeform optics promises to deliver increasingly compact, lightweight, and easily targetable LED lighting, space sensing instruments, mobile displays, and a host of other applications. By showing how to make freeform optical components, the Center for Freeform Optics is bringing new industry partners to the University of Rochester. This, in turn, provides Institute of Optics students not only research opportunities but valuable experience working with outside companies. For example, Di Xu, a PhD student, began working with CeFO in January on a project that uses optical coherence tomography to measure freeform optical surfaces. 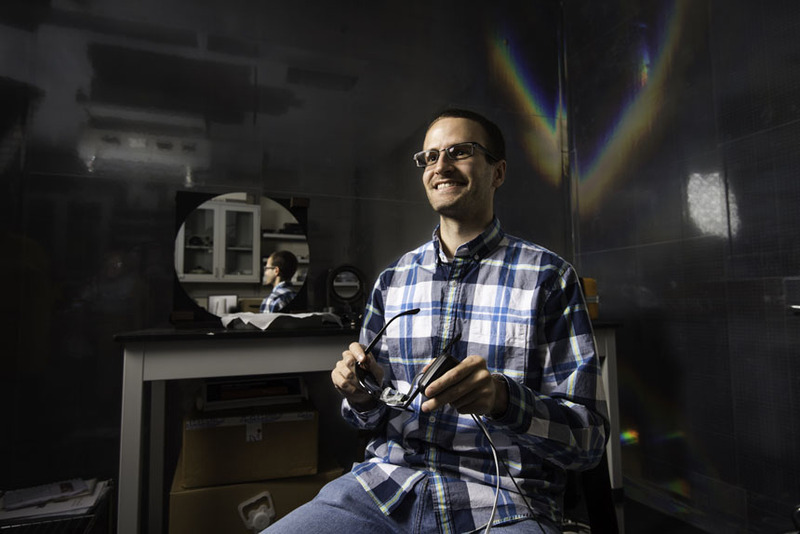 Aaron Bauer, who finished his PhD in June, demonstrated the feasibility of using freeform optics to create compact head-worn displays and related technologies. He will stay on at least another year as a research engineer developing prototypes for projects spawned by CeFO. “I had been doing freeform optics even before the Center for Freeform Optics started, so it gave me some validation that what I had been working on was important and useful,” says Bauer. Since its 2013 launch under an award from the National Science Foundation, CeFO has been shaping the future of optical instrumentation on a global scale. The center started with seven pioneer members—Air Force Research Laboratory (AFRL), Ball Aerospace and Technologies Corp., OptiPro Systems, PolymerPlus LLC, Rochester Precision Optics, SCHOTT North America Inc., and Zygo Corporation. It has more than doubled that number during the past year with the addition of Aperture Optical Sciences Inc., Corning, Eminess Technologies, Jet Propulsion Laboratory, L-3 Communications, Microsoft, Nikon Research Corporation of America, Oculus, and global partners ARRI, PerkinElmer Health Sciences, and Zeiss. Funding for the center recently expanded to reach more than $1 million in cash flow in 2016 alone. The joint venture of the University of Rochester and the University of North Carolina Charlotte brings the universities and companies together at the precompetitive stage of a promising new technology. The projects they share are at the interface between fundamental and applied research and are driven by applications that companies could eventually market. The Rochester team, Rolland adds, represents a “good synergy” between the Department of Mechanical Engineering and the Institute of Optics. John Lambropoulos, chair of mechanical engineering, serves as CeFO’s associate director. Miguel Alonso, James Fienup, and Nick Vamivakas of optics, and Stephen Burns, Jonathan Ellis, and Paul Funkenbusch of mechanical engineering are the other faculty members involved in supervising a total of 11 current projects. The funding and intellectual property are jointly shared by affiliates. In addition, companies can simultaneously pursue private projects with CeFO faculty. Members have engaged in partnerships among themselves as a result of relationships developed under CeFO. There are also pathways as a member to obtain first rights to an exclusive license, Rolland says. 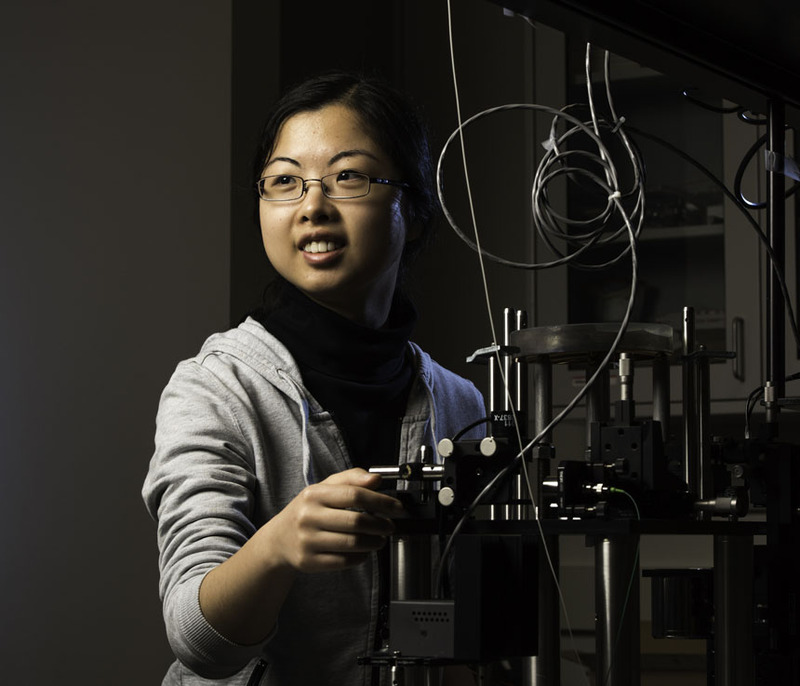 Di Xu, a PhD student in optics, works with metrology equipment used to test freeform surfaces designed by the Center for Freeform Optics at the University of Rochester. “The program is also an opportunity for students and companies to ‘size each other up’ for potential longer-term relationships—including employment after graduation,” Rolland adds.